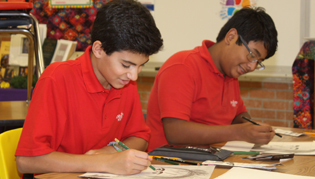 Incarnate Word Academy (IWA) is unique in its focus, composition, and orientation. IWA aims at educating the whole person: integrating the intellectual, spiritual, emotional, moral, and physical development of the child. The school has traditional and Montessori programs at its elementary level, and a middle level and high school level on its campus. Students at IWA cultivate a life-long love for learning and service, experience Christian community, and grow in commitment to Gospel values. 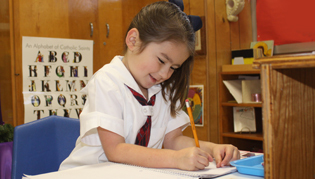 IWA Elementary Level includes both Montessori (Age 3-Grade 5) and Traditional (K3-Grade 5) programs. Children can soar as high as their interests and abilities take them. The highly individualized Montessori program uses an array of stimulating learning materials that gently encourages independent thinking and progress. The traditional program provides enrichment opportunities in all subject areas. All students participate in art, music, and Spanish classes. The IWA Middle Level (Grades 6-8) curriculum encompasses a variety of learning experiences that are planned, guided, and directed by a team of teachers for each grade level. Integrating the middle child's growth in the learning process, the approach addresses interaction, decision-making, and personal responsibility. 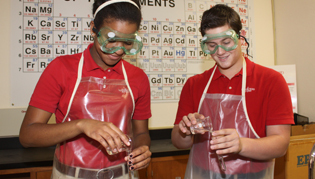 IWA High School Level (Grades 9-12) offers a college preparatory curriculum, which includes diverse areas of study and a wide variety of electives. The advanced placement and dual enrollment courses challenge gifted students and prepare them for university studies. All students participate in religious studies and community service and have an opportunity for guidance and worship. At all levels, a student's learning begins in wonder, becomes an adventure, and demands active participation and motivated performance. Students learn to explore and to think for themselves. They learn to set goals and master basics. They learn to find, organize, and apply information and to inquire and solve problems. They learn to critique what they hear and read, to support opinion with evidence, and to search for and respect truth. Through the successes and challenges of growing up, students at IWA learn to value the difficult times as well as the wonderful times of their lives. Healthy self-esteem encourages them to participate in activities of their interest and teaches them that winning is not everything. Accredited by the Southern Association of Colleges and Schools, AdvancEd, and the Texas Education Agency through the Accreditation Commission of the Texas Catholic Conference Education Department, IWA's specialty is working together as a team to integrate faith development with high academic standards. At IWA, students learn that discovering their principles and struggling to live by them is the greatest knowledge of all.